Time for The Vamps new song, well that's if I don't die before hand since the light in my room is flickering and scaring the hell out of me. This is their new song, and the music video has only just been released. Unfortunately it's not a scary music video to go with my scared mood at the moment due to the flickering light above my head, yet this is more of where's-the-celebrity music video, or spot-the-star video. Ahhhhhh, my light has just gone out! My laptop is my only source for light, and the wind is making scary noises outside my window... DEEP BREATH. The Vamps show how their image has matured, and yet they are still children inside, throwing parties and having fun, but where's the fun song to go with it? 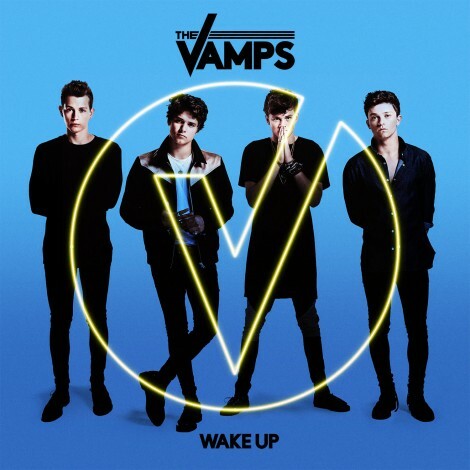 The Vamps consist of Connor Ball, Tristan Evans, James McVey and Brad Simpson. They have yet to reach number one on the Singles chart here in the UK, coming a close number two with "Can We Dance" which was slightly beaten by OneRepublic's "Counting Stars". As well as that, they got a number two with "Last Night", which was beaten to the top spot by Sigma's "Nobody To Love". They are after that all important number one, but will it take them as long as it did for The Saturdays? We'll have to wait and see. This is their new single, written by Rami Yacoub, Carl Falk, Savan Kotecha and Johan Schuster; names we hear and I type again and again. Doesn't sound much of a hit, and totally surprised The Vamps haven't written it, they also haven't wrote most of their songs on their album, which is totally different compared to their first album. Could this explain why their first single from this album, "Wake Up", didn't hit the Top 10? They need a hit single next, and this surely isn't it. The video shows a different side to each person in the band, where they host their own parties. Yet I can't help but think that for some of their parties, they aren't being their true selves. It kind of reminds me of Jessie J's "It's My Party". Yet whereas that is a fun song that relates to the video, this one really doesn't. I like the ending, creating one big manic party. I also like how there are many different stars at each of the parties. This has been done a few times before, especially in New Found Glory's "Kiss Me". The stars that feature in this music video includes: Conor Maynard, Oli White, Dynamo, New Hope Club, Nina Nesbitt, Cel Spellman and Maisie Williams. If you spot anyone I've missed, include it in the comments below. Overall a star studded cast in this fun video, yet it doesn't relate to the song all that much. Fun, wild, crazy, manic, all the words to describe the perfect party, with product placement of the Wizboard, these are everywhere at the moment, and I think it's going to stay that way. Unfortunately this video could have linked to any song, it wouldn't have mattered.